Not many anglers venturing out due to weather. The lake has risen considerably over the last couple weeks. NDOW planted the lake with over 4000 lbs of rainbow trout recently. Shore anglers have been having the best luck with Green Powerbait or inflated night crawlers. 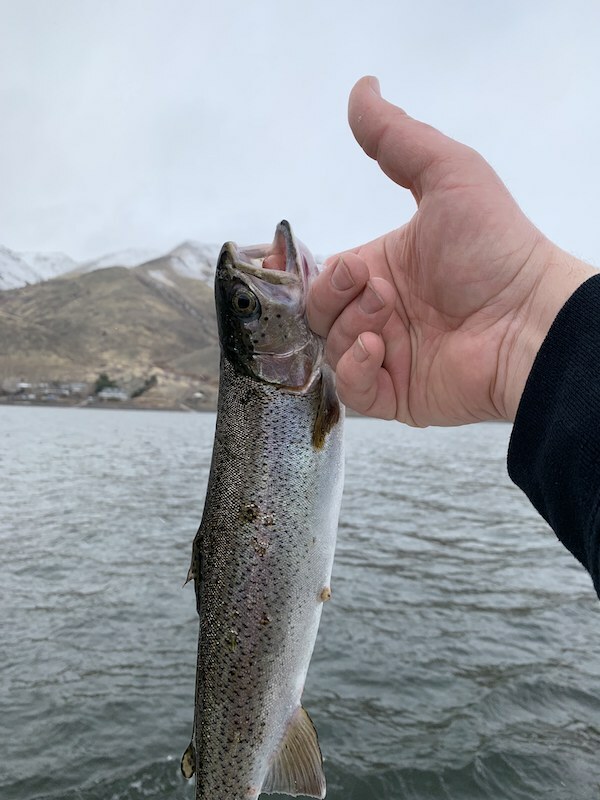 A few weeks ago while I was at work, my fishing partner Tom Blotter from Minden NV sent me a photo of a nice 3.5 lb tagged rainbow he caught off the shore. The derby results have been coming in a little slower due to this recent weather we are having. Week 5 results are, Bob Brister from Topaz Ranch estates took 1st place with a 9 lb 4.08 oz 26 inch rainbow. 2nd place went to Jackie Davis with a 7 lb 6.3 oz 27 inch rainbow. As of tow week ago there had been 116 trout weighed in 2 lbs and larger. For more information call the Topaz Lodge at 775-266-3337.